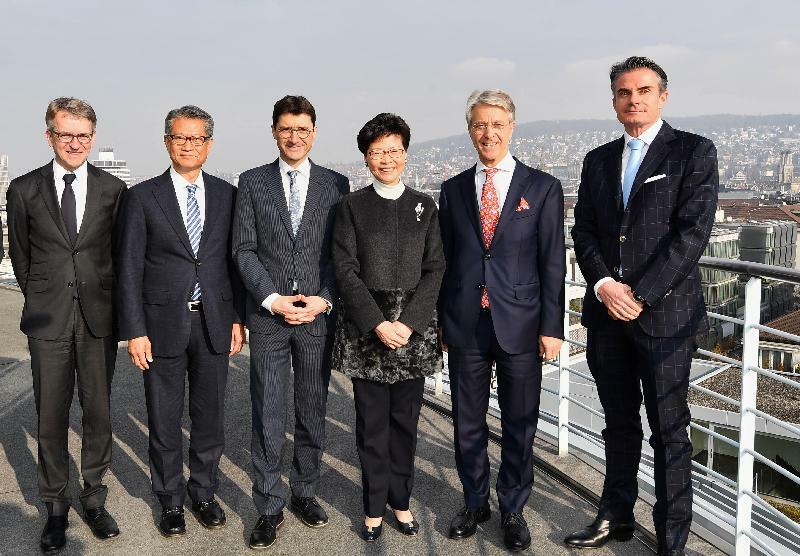 The Chief Executive, Mrs Carrie Lam, arrived in Zurich, Switzerland yesterday morning (January 21, Zurich time) and met with the Mayor of Zurich and members of the Swiss Bankers Association, briefing them on the latest developments in Hong Kong before proceeding to Davos to attend the World Economic Forum Annual Meeting. Accompanied by the Financial Secretary, Mr Paul Chan, Mrs Lam called on the Mayor of Zurich, Ms Corine Mauch yesterday morning. Mrs Lam said she was pleased to meet Ms Mauch for the third time in three years, which was testimony to the importance that both Hong Kong and Zurich attach to the relationship between the two places. 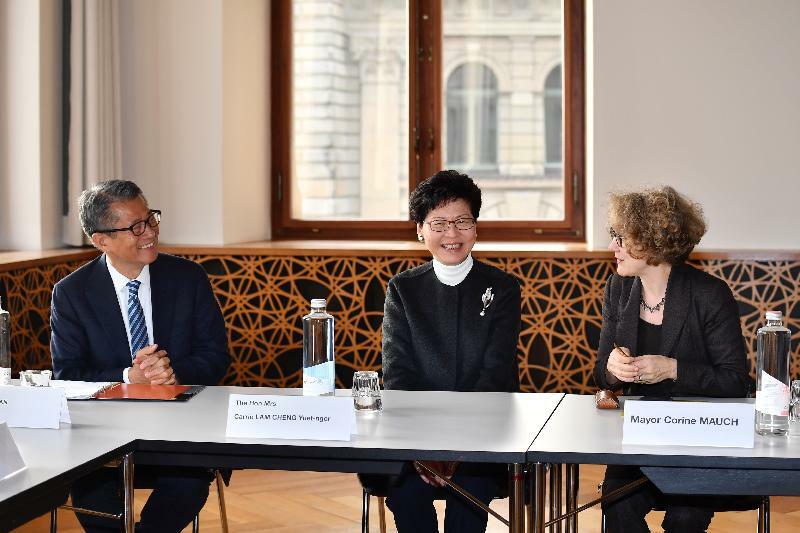 Pointing out that Switzerland and Hong Kong have always enjoyed close trade ties and that both Hong Kong and Zurich are international financial centres, she said that the two cities could learn from each other. Mrs Lam also shared with Ms Mauch details of Hong Kong's latest developments in finance, innovation and technology (I&T), design and smart city, and expressed the hope that collaboration in these areas as well as exchanges between young people of the two cities could be enhanced. Mrs Lam and the Hong Kong delegation then joined a lunch meeting organised by the Swiss Bankers Association. 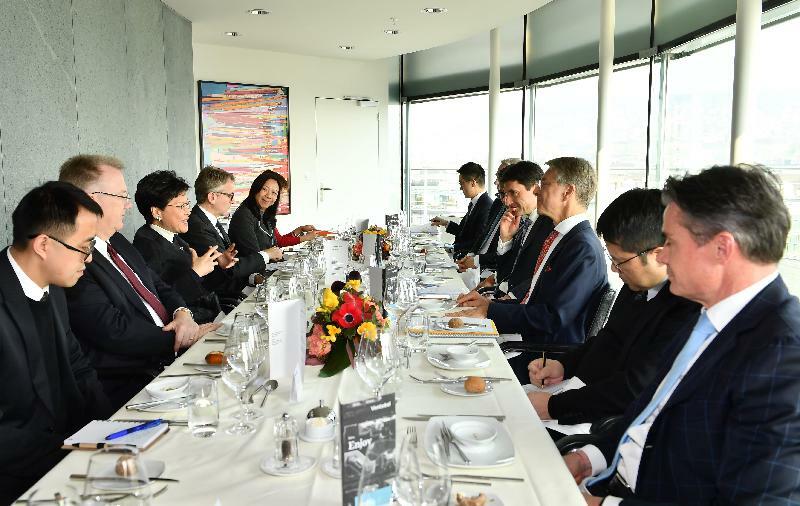 During the meeting, Mrs Lam and the Head of the Swiss State Secretariat for International Financial Matters, Mr Jörg Gasser, the Chairman of the Swiss Bankers Association, Mr Herbert Scheidt, and other association members exchanged views on financial technology, private wealth management, the opening-up of the financial markets in the Mainland and the Belt and Road Initiative. Mrs Lam said that in order to create a favourable environment for the development of different trades in Hong Kong including the financial sector, the Hong Kong Special Administrative Region (HKSAR) Government would not only assume the roles of service provider and regulator, but would also act as facilitator and promoter. Noting that she had witnessed the signing of a memorandum of understanding on the promotion of private wealth management between the Swiss Bankers Association and the Private Wealth Management Association of Hong Kong in Switzerland in January last year, she said she hoped the two organisations could build on this solid foundation to explore co-operation on wealth management businesses in Asia and leverage the opportunities arising from the Guangdong-Hong Kong-Macao Greater Bay Area development. The Swiss Bankers Association is the largest banking association in Switzerland, with more than 250 member institutions. In the afternoon, Mrs Lam went to Davos, where she attended an entrepreneur dinner on artificial intelligence co-hosted by the Canton of Zurich and the Canton of Grisons, Switzerland. Addressing the representatives of I&T entreprises, Mrs Lam said that the HKSAR Government is keen to advance I&T development, and has in the past 18 months committed a total amount equivalent to US$10 billion towards an array of I&T programmes and initiatives, including the establishment of two world-class research clusters specialising in healthcare technologies and artificial intelligence and robotics at the Hong Kong Science Park. She added that she would welcome Swiss I&T entreprises, startups, scientists, researchers and innovators to come and make use of the two research clusters and collaborate with Hong Kong to jointly shape the future of artificial intelligence and technology. Mrs Lam and Mr Chan met with the President of the National Academy of Medicine of the United States, Dr Victor Dzau, this morning (January 22, Davos time) to keep abreast of the latest developments of healthcare technologies in the United States. Mrs Lam and Mr Chan also met with the President of the New York Stock Exchange, Ms Stacey Cunningham, and exchanged views on the latest developments in the securities industry, as well as exploring ideas for co-operation. Mrs Lam noted that Hong Kong and New York are international financial centres, and that the Hong Kong Exchanges and Clearing Limited and the New York Stock Exchange ranked top globally in terms of funds raised through initial public offerings last year. Adding that Hong Kong strives to attract more overseas enterprises to list in Hong Kong and provides a fundraising platform for new economy companies, she expressed the hope that the two places would enhance exchanges and collaboration in relevant aspects. 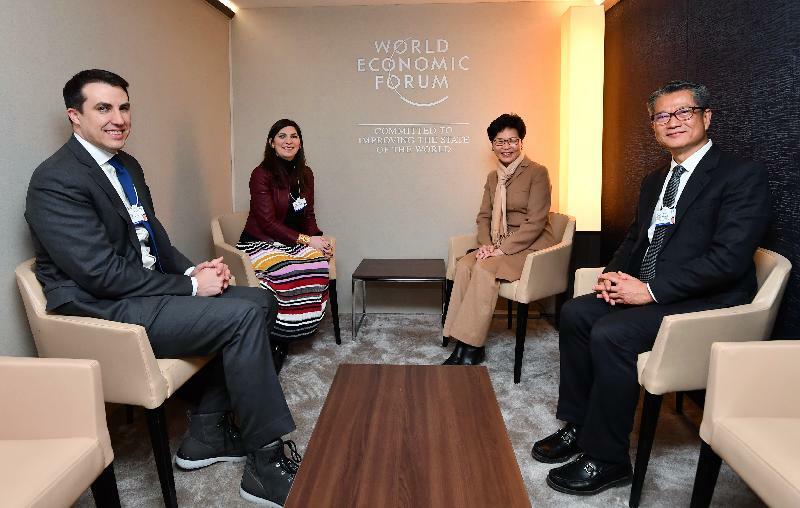 Mrs Lam is continuing her visit to Davos today.